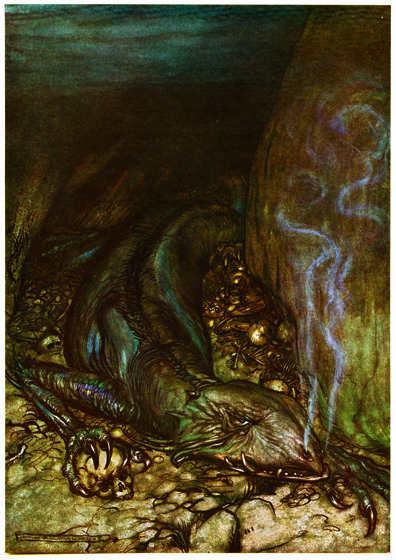 The dragon, Fafner, emerging from his lair. Arthur Rackham (1867-1939) was one of the few illustrators as skillful at showing us the visible world as the realms and inhabitants of the imagination. Rackham's fairies are superbly beautiful, but he also pictures magnificently grotesque creatures that no one has ever seen, at least not outside of dreams and nightmares. His animate trees are undeniably real, albeit not something to be met with on a dark night, but many of his other visions show us beings and things we cannot place or define.